I had a lot of fun on Black Friday/Cyber Monday....maybe a little too much fun. Fun to the point of making purchases well beyond Cyber Monday. Case and point: Bee Mine Products. I had been wanting to try their product line ever since I learned about it early in my transition via Hey Fran Hey. I never make my introduction to new brands at full price, so when Bee Mine launched their holiday sale with 40% off, I was in there like swimwear! I ordered 2 16oz bottles of the Avocado Cream Balanced Conditioner, and one 16oz jar of the Bee hold Curly Butter. I figured a butter and conditioner would be a safe introduction to any product line. Did they stack up to my expectations? Keep reading to find out! Availability: I purchased my products at www.beemineproducts.com during their holiday sale. Their products aren't available on the ground anywhere in LA, but they do have locations in places like Chicago, Houston, and Raleigh. They can also be purchased on CurlMart. Click here to see if Bee Mine products are sold on the shelves anywhere near you. Affordability: Normally, the 16oz Avocado Cream Balanced Conditioner retails for $20, and the Bee Hold Curly Butter goes for $23. A little pricier than the typical natural hair product range, but as I mentioned previously, I got that good 40% discount! That means I spent $24 on 2 16oz conditioners, and $13.80 for the butter. Those prices are a lot more doable. Organic Aloe Juice: Acts as a natural conditioning agent that restores the hair's sheen, luster, and shine. It not only makes the hair soft, but it also enhances strength and suppleness. Organic Lavender & Chamomile Distillate: An extraction of lavender and chamomile that provides soothing, anti-inflammatory support to the scalp and follicles. Cetearyl Alcohol: "Fatty alcohol" -- NOT to be confused with drying alcohols such as ethyl. Acts as a lubricant, thickener, and emollient. Also give conditioner its velvety feel without making hair greasy. Is additionally used to keep product ingredients from separating. Castor Oil: Thick and highly viscous oil pressed oil from the castor bean that contains antibacterial and anti-fungal properties. Also believed to help thicken the hair, and promote growth while enhancing shine. Avocado Butter: Omega 3-rich nourishing butter extract that can enhances shine, moisture retention, softness, and elasticity in hair. Product Claim/Description: This nourishing conditioner is enriched with pro-vitamins, extracts & proteins that compact the cuticle layer of the hair resulting in nourished hair that isn't weighed down. It will leave your hair silky, soft, bouncy and more manageable. Performance/Delivery: I used the Avocado Cream Balanced Conditioner about three different ways before I decided to even begin speaking on the product. First, I used it as a conditioner, per the instructions on the bottle. Because of the consistency (it feels more like a hair lotion than a conditioner), I was a little concerned about what it could actually do for my hair. I smoothed it through my freshly cowashed strands in sections, and let it sit for about 5 minutes while I got my shower on. Upon rinse out, I was pretty hype. My hair looked and felt sooooo smooth and shiny! I was definitely impressed by how quickly it worked to condition my hair. It definitely had my frizz in check! Next, I tried Avocado Cream Balanced Conditioner as a leave-in. I worked it through my strands, and squeezed out the excess -- and then applied the Bee Hold Curly Butter on top. It worked very well as a leave-in, and was the perfect consistency to be a super-moisturizing base for my styling products without weighing my hair down. And lastly, as I'm writing this review, I have Avocado Cream Balanced conditioner in my hair only -- and it has given me the fluffiest, softest, and most voluminous wash and go ever. It's not one of those conditioners that gives tons of hold and definition, but if you just want your hair to be ridiculously moisturized, soft, smooth, and fluffy -- this is the one! I touched a little on consistency earlier, it's definitely not a thick conditioner. 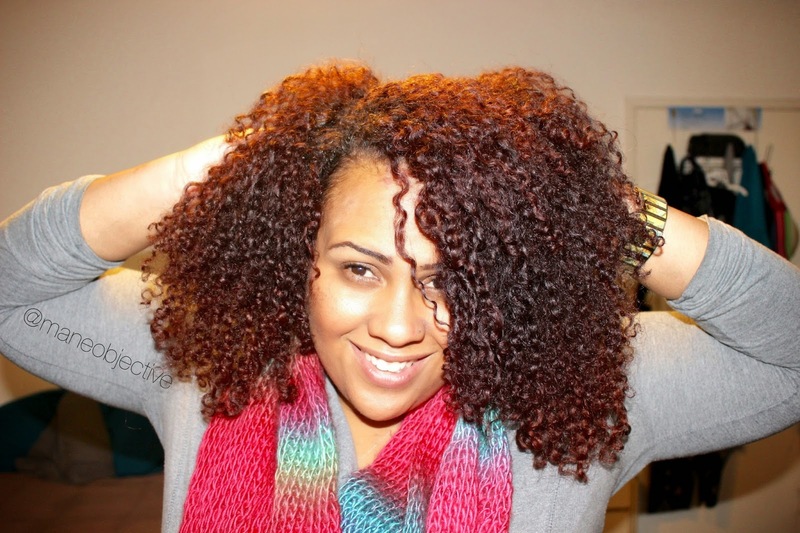 The thickness is very similar to Beautiful Textures Tangle Taming Leave-In, if you've ever tried it. I don't consider the consistency a drawback though -- this actually primes it to be a multi-use product. Word on the street is that it can be used as a daily moisturizer, too! I purchased the Avocado Cream Balanced Conditioner in the Coconut Cream fragrance, because Island Mango wasn't available (sad face). The fragrance is pretty sweet and gentle, like a coconut lotion. It's not a bad fragrance at all -- I just really, really...like, really like their Island Mango scent. Drawbacks: To be honest, I wish the product had a little more slip. It has slip, but not enough to qualify as a conditioner I'd detangle with. It is great at helping keep previously detangled hair untangled, but is by no means a product I'd start out with to help remove shed hairs, knots, and tangles from my hair. Bonuses: I absolutely LOVE the ingredient list. To be honest, it's pretty amazing and sure to please any ingredient-conscious naturalista. My hair fangirls over anything involving aloe and avocado, so this product was right up my alley! It also contains protein, which is another huge bonus for me. Given that I've got this hair color, any product that can help reinforce strength is an automatic plus! Bottom Line: The product performs as it says it will, which is a miracle in and of itself. How many bottle contents and labels line up with performance these days?! I do wish it had a little more slip, but I'll take what I can get from a product with such a stellar ingredient list. If you're looking for "clean" hair products and responsible, effective ingredients, Bee Mine's Avocado Cream Balanced Conditioner is definitely the way to go. Overall Product Rating: 4.5 stars. It's a solid, multi-use product that does exactly what it says it will do! I'm already through with one bottle, and trying to contain myself about cracking the next bottle open -- I don't want to run out before another sale! Best Practices: Use on hair that has been previously detangled. Then you're golden! Ingredient List: 100% Organic Shea Butter, 100% Organic Aloe Vera Gel, Essential Oil Blend, Vegetable Glycerin, Rosemary Leaf and Chamomile Extract, Silk Powder, Paraben & Formaldehyde Free Preservative and Perfume. Essential Oil Blend: Their proprietary essential oil blend, lol. Glycerin: Vegetable-based humectant that draws moisture from the air into the hair to keep it hydrated. Rosemary Leaf: Extract that stimulates follicles, promotes growth, serves as an anti-fungal, and strengthens the root of the hair as well. Product Claim/Description: This shea butter and aloe based curly butter is packed with rich moisturizing nutrients to give you long lasting moisture and promote growth. It has a soft touchable hold that will help to defrizz your frizzes and give great definition. This Curly Butter is wonderful for twists, finger curls, puffs/pony tails and especially for laying down unruly hair. Great for naturals, relaxed, texlaxed, everyone. Performance/Delivery: You know how you expect a product to be one thing, but you open it up and it's another? That was my experience with Bee Hold Curly Butter. Based on the description I assumed it would be a Shea buttery butter with aloe whipped in. The exact opposite proved to be true -- it was more like aloe gel with shea whipped in. I didn't have a problem with this revelation at all -- given that too much shea butter can have my hair looking stringy and greasy, I welcomed this new type of butter gel. First of all, the fragrance is everything I had ever hoped for in an Island Mango scent. Not only does it smell delightful, the fragrance blends ever so nicely when you layer it in with other products. The consistency reminds me of Obia Curl Enhancing Custard, and the two actually blend together beautifully. But more on that later. 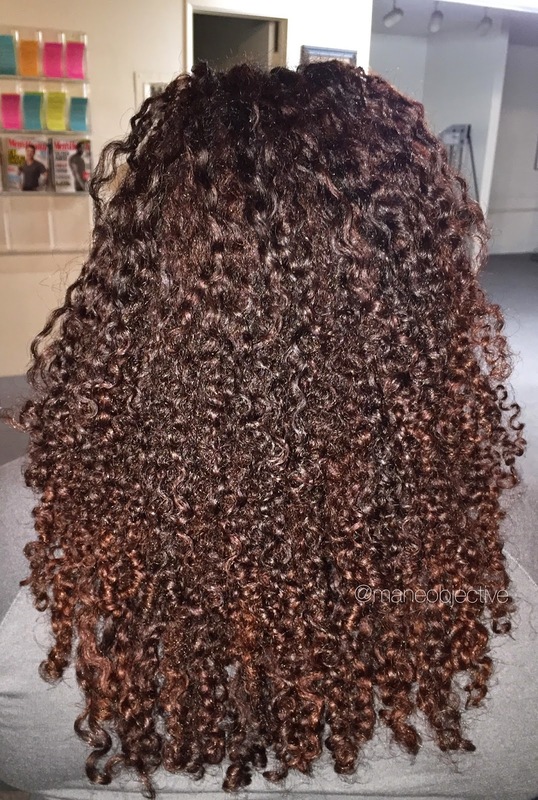 From what I gather, the Bee Hold Curly Butter is a hybrid, multi-use product. I've used it as a styler, moisturizer, and root refresher. As a styler, it functions like those "heavyweight light" gels -- they go on heavy, and dry light. In Bee Mine's case, super light. I don't use aloe vera gel itself as a styler, because it doesn't provide enough hold for me. 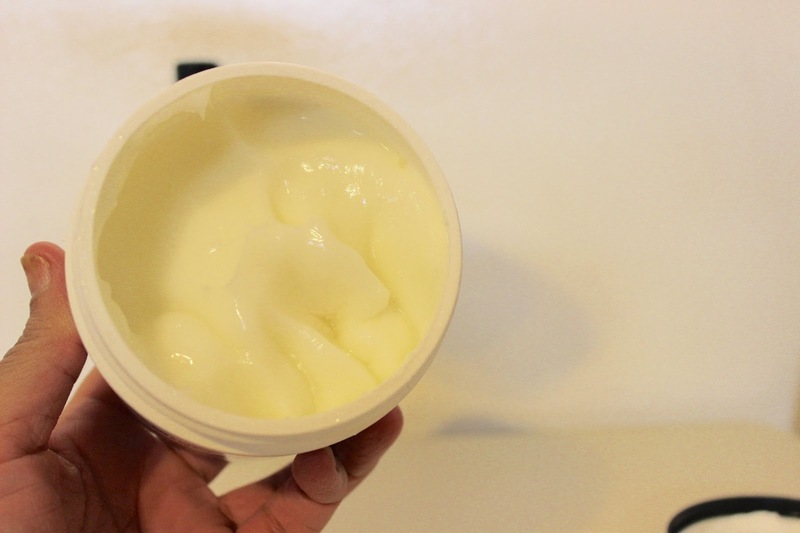 Bee Hold Curly Butter does provide a wee bit more hold, but not enough for my multi-day wear wash and go comfort. I've gotten the most success using it as a moisturizer and root refresher. What the heck is a root refresher? Allow me to explain. I've been using the Bee Hold Curly Butter as the moisturizer (C) in my LCO method, and it works beautifully to minimize frizz, increase shine, and keep my #curlsonfleek. In the photo above and below, you see my wet and (almost) dry hair with LRC Shake & Go as my leave-in, Bee Hold Curly Butter for moisture, and Obia Curl Enhancing Custard for definition and hold. You can see how crucial Bee Hold was by looking at the top of my hair near the side part. You see how it still has definition and texture, but is elongated? Yasssssss! 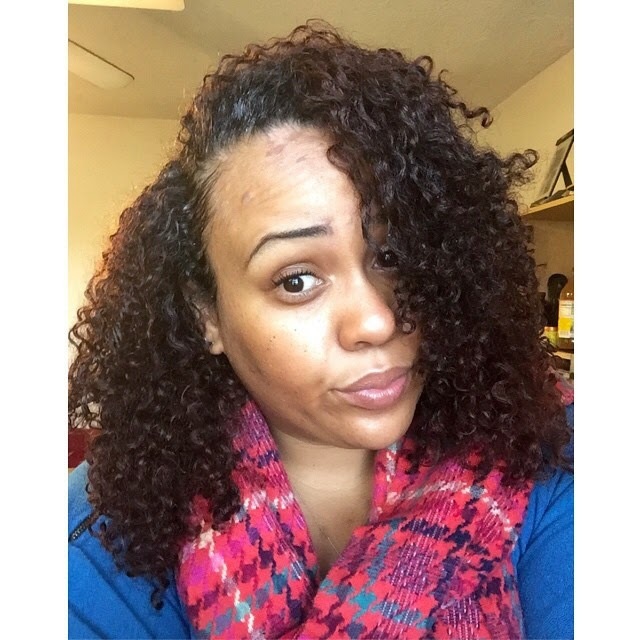 Drawbacks: I was initially stumped about how to use Bee Hold Curly Butter in my regimen. But now that I've figured it out, that is no longer an issue.I wish it had a little more hold, so that I could use it as a wash and go product, though. Bonuses: The smell, oh the smell! Seriously, Island Mango is EVERYTHING. The other bonus for me is the lightweight moisture. 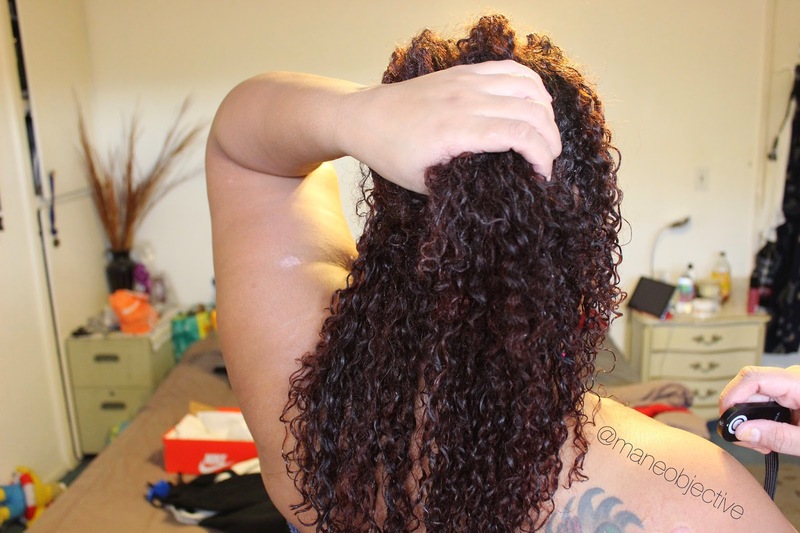 I get the benefits of shea butter without my hair being weighed down or greasy. Perfect for transitioners or fine haired sistas! But really, if you're an aloe lover, it is most certainly worth a try. Overall Product Rating: 4.5 stars. If it had a little more hold, easily a 5 star product. Best Practices: Like all product combinations, mix them in your hands or do a test patch to make sure they blend well together. Although the Bee Hold is natural, sometimes products don't play too nicely. Well, there you have it, folks! 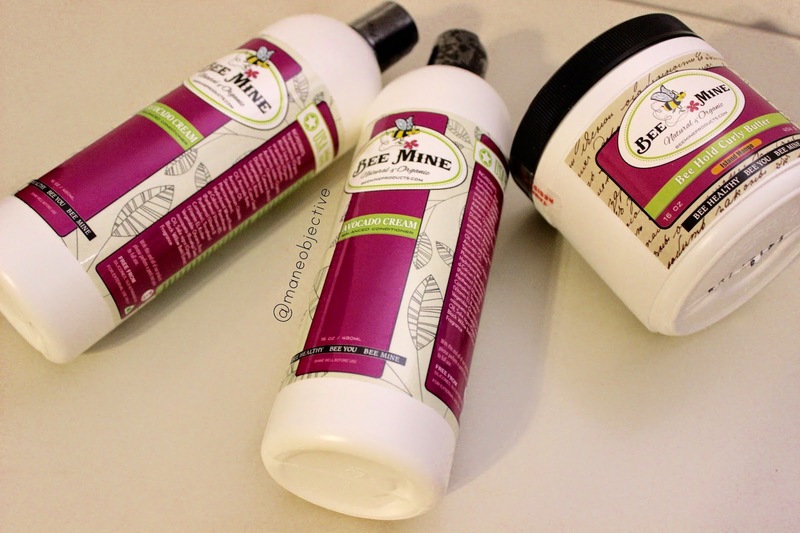 Have you ever tried Bee Mine Products? I enjoyed my introduction to the line -- it makes me curious about their other offerings! 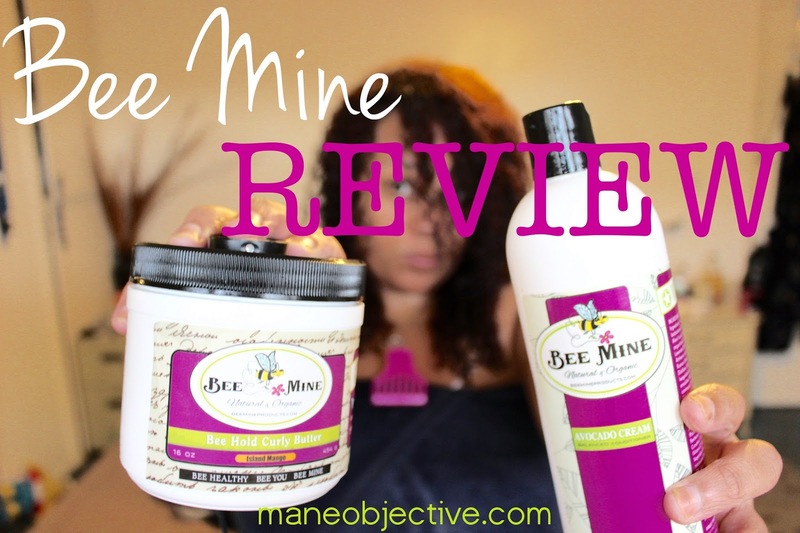 Please do a review on the Bee Mine Bee-U-Ti-Ful Deep Conditioner! If I can get my hands on it, absolutely!!! Have you ever tried the Macadamia Natural Oil Deep Repair Masque? A lot of people swear by this product but I just want to know if you can do a review on it sometime in the future. Thanks. Coconut oil has many benefits of it. You can use it for hair problems, skin problems etc. To its best results, add few drops of tea tree oil in it and see the difference.